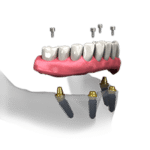 Patients missing all their teeth are often left to wear dentures, which is a traditional but insecure solution to replacing multiple teeth at once. 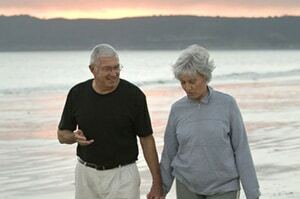 Traditional dentures can be inconvenient, painful, and make every day tasks like eating or speaking difficult. 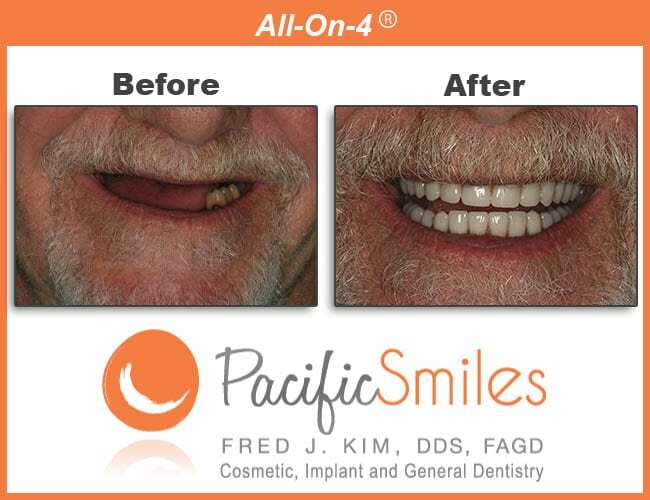 All-On-4® Dental Implants is the modern solution to replacing multiple missing teeth as a permanent, secure solution to overcoming these inconvenient problems patients often have with dentures. All-On-4® Dental Implants are not removable, and there is no palate or excess material, creating a better lifestyle by making it easier to eat, speak, and also maintain teeth for patients on a daily basis. 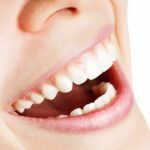 Alongside creating a better lifestyle for patients when it comes to every day tasks like eating and speaking, the benefits to this innovative technique are numerous. One of the largest benefits is the elimination of extensive bone grafting and/or sinus grafting, significantly reducing the expense of the procedure as well as the length of treatment to just a couple months. Other benefits include easier maintenance (compared to the alternative, dentures), bone level stabilization, functionality, feeling (it feels like natural teeth), an attractive smile, and the ability to enhance your smile in just one day (aka “Teeth In A Day” or “Teeth In One Day”). 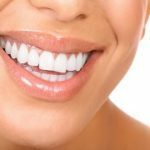 Dr. Kim at Pacific Smiles has had extensive experience as well as amazing results from his many patients that have had this modern procedure. 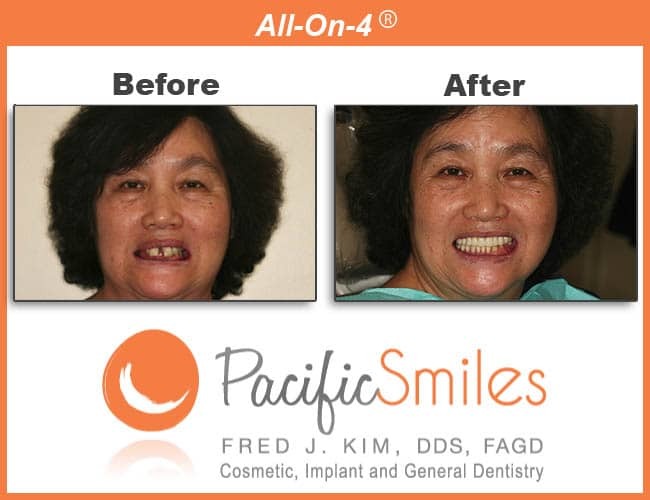 The photos above are of Dr. Kim’s patients, and you can view additional before and after results in our All-On-4® Gallery. 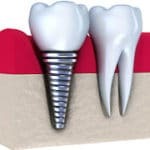 For years, Dr. Kim has provided his patients with the highest level of Implant Dentistry, out of both his 10 plus years of experience as well as the extensive training in the surgical placement of dental implants he has received. Dr. Kim believes in high quality not just in the work he performs, but also in the materials he uses with his patients. Most dental centers make their final teeth out of Acrylic or PMMA, but Dr. Kim makes his out of a stronger and more durable material, zirconia that is layered with porcelain for dental aesthetics. This is a large differentiating factor between Pacific Smiles and other dental centers, as the importance for long-term durability and lasting results for our patients is a high priority to us. Note: Not included with the fee is the cost of sedation, which is payable directly to the anesthesiologist. An approximate sedation rate is about $1,500 for a single arch and $2,000 for both arches. If you believe the All-on-4® treatment concept is right for you, Dr. Kim is happy to provide you a free consultation that will go over your options in an unbiased, no pressure environment. Contact us today and let us help craft the perfect smile for you.